Worcester, Mass. -- It is relatively uncommon in high school football to face a must-win scenario in just the second week of the season. But playing in the NEPSAC, where your schedule consists of only eight games, you learn quickly that everyone of them serves a meaningful purpose. Phillips Exeter and Worcester Academy walked into Friday night's NEPSAC Class A tilt at Morse Field both in need of a victory after suffering setbacks in their respective season-openers one week ago. 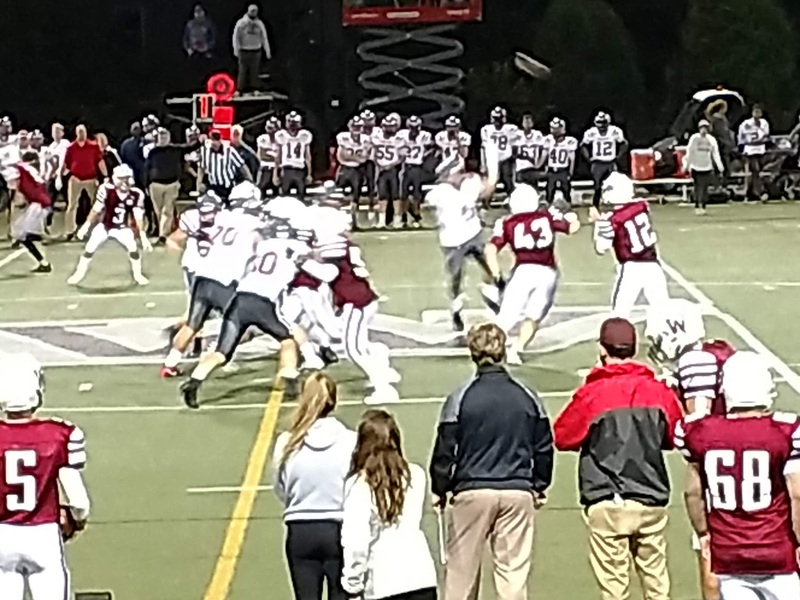 In a contest lasting nearly 3 1/2 hours, due to a large rash of penalties and injuries, it was Worcester Academy who succeeded in its mission as behind six total touchdowns from quarterback Asa Floyd, they handed Phillips Exeter a 44-27 defeat. Displaying a solid right arm filled with strength and accuracy, Floyd finished 19 of 31 through the air for 338 yards. All four of of Floyds’ touchdown passes ended up in the hands of senior receiver Zukudo Igwenagu. The Rutgers commit finished with seven receptions totaling 252 yards. As a team, Worcester Academy mounted 482 yards of offense while limiting Phillips Exeter to 79. The majority of the Big Red’s damage came courtesy of special teams in which they had three kick returns result in scores. Other than that, the Hilltoppers, who were upended by Cheshire Academy last week, dominated both lines of scrimmage. Phillips Exeter’s smaller defensive backs found life miserable in trying to cover the six-foot four-inch Igwenagu, as he was faced with one-on-coverage nearly the entire evening. Igwenagu’s first touchdown catch went for 36 yards came midway through the first quarter for a 7-0 lead. On the ensuing kickoff, a Big Red fumble resulted in Elijah Smith picking up the loose ball and bolting 49 yards to pull Philips Exeter within 7-6. On Worcester Academy’s next possession, the Hilltoppers marched 75 yards before Igwenagu caught a 19 yard tipped ball in the back of the end zone extending Worcester Academy’s lead to 14-6 with a minute remaining in the initial quarter. With the Big Red continuing to struggle on offense, the Hilltoppers never let up. A Floyd 5 yard scoring run made it a two score game. After Cole Glennon’s 92 yard kick return for Phillips Exeter cut the deficit in half, a Big Red turnover a few moments later led to a Floyd 1 yard dive across the goal line to make it 26-13 with 5:16 left before halftime. Late in quarter, Igwenagu hauled in his third touchdown pass of the evening, this time for 31 yards, that extended the Hilltoppers advantage to 19 points. But with just a handful of seconds remaining before intermission, Phillips Exeter’s offense finally came to life. A nice catch and run by Glennon, netting 37 yards, sent the Big Red into the break down 32-20. Getting the kickoff to open the second half, Phillips Exeter made things a bit more interesting after Glennon, a senior, danced his way down field 83 yards to put the Big Red within striking distance, trailing 32-27. But Philips Exeter not got any closer..
A costly fumble on a punt return resulted in a 1 yard touchdown run by Hilltoppers running back Kevon Darton. Then, with just 8 seconds remaining in the third, Floyd connected with Igwenagu on a well-designed 59 yard touchdown pass to secure Worcester Academy’s first triumph of the season.